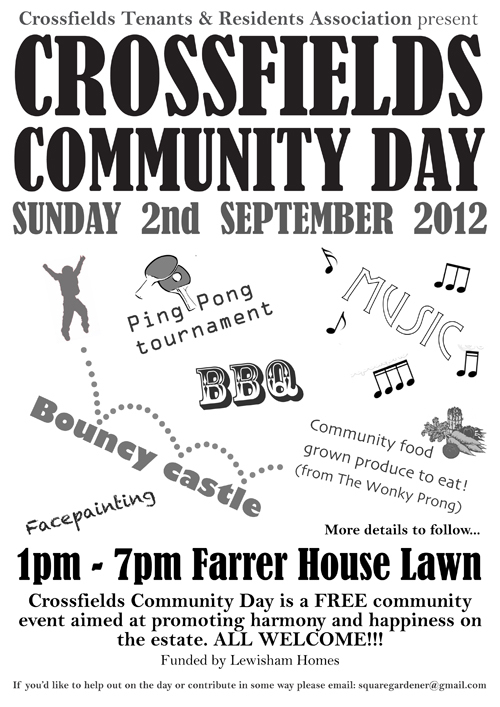 If you're up and about early this coming Sunday morning (around 9am), your assistance would be gratefully appreciated in helping to set up for the Crossfields Community Day. Contact TRA Chair Tim (07941 861806 or email him). 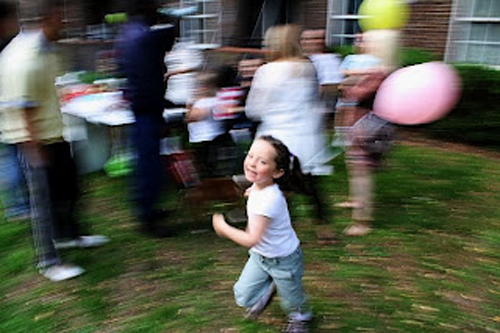 If all goes to plan there will be: live music by local musicians, games with Madcap Coalition, a BBQ with homemade burgers, cooked produce from the Wonky Prong community garden, a Bouncy Castle for children AND adults, outdoor Ping Pong, face painting, balloon modelling, and who knows what else! Maybe the traditional Crossfields Tug O' War if some strong person can help drag out the rope from its storage place. Hopefully, there'll be a little sunshine too! 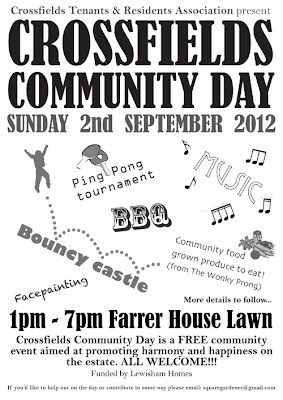 Crossfields Community Day is a FREE community event aimed at promoting harmony and happiness on the estate. ALL WELCOME! UPDATE: Thanks to Tim for organising against the odds, and to Madcap who were invited at the last minute to bring some special ingredients to the mix. "DJ from 1pm, then at 1.30 we have Joe Wilkes acoustic folk rock duo with guitar and violin, then we have The Kitchen Winos at 2pm, DJ from 2.45 followed by Dr Burnheart Gloss and Pocket the Clown causing mayhem with the Madcap Olympics, followed by the communal tug'o'war. Plus! live music from the Les Is More Orchestra at 4.30pm..."
Crossfields residents may recall some pretty odd goings on underneath our arches back in June, when Teatro Vivo last performed their promenade theatre piece The Odyssey. The company has now been invited back by The Albany to restage their 'theatrical adventure' as part of the 'Albany Outdoors' Festival. 'The Odyssey' takes the audience out through the streets and hidden corners of Deptford (including Crossfields) to retell the story of "an epic journey into the unknown". This Saturday there is an outdoor musical tribute to Lol Coxhill, who died last month. Musicians include Charles Hayward, Steve Noble, Alex Ward, Nick Doyne-Ditmas and Sue Ferrar. 5pm-7pm, McMillan Herb Garden, McMillan Street. Free entry, voluntary contribution, all proceeds to Lol's partner Ulrike. 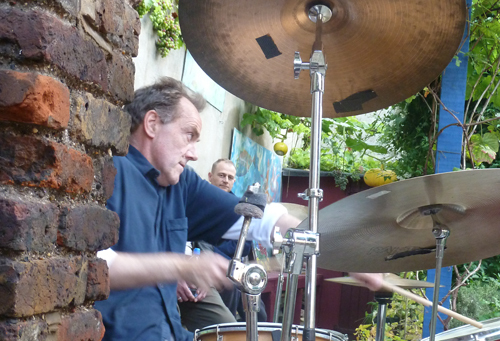 A tribute also took place at the Herb Garden last Bank Holiday Monday with musicians Tom Scott, Nick Doyne-Ditmas, Adrian Northover and Simon Coxhill, hosted by Joe Bazouki. A mulberry tree was planted in Lol's memory (see Transpontine). 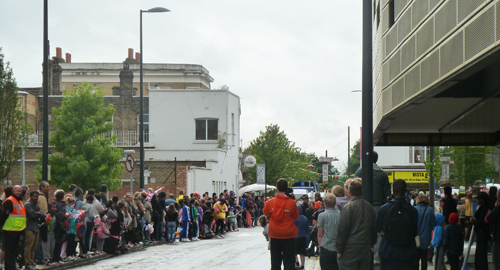 Crossfields formed the backdrop again for an Olympic torch handover this afternoon, as the Paralympic Torch Relay passed through Deptford on its way to Stratford at around 5.15pm. 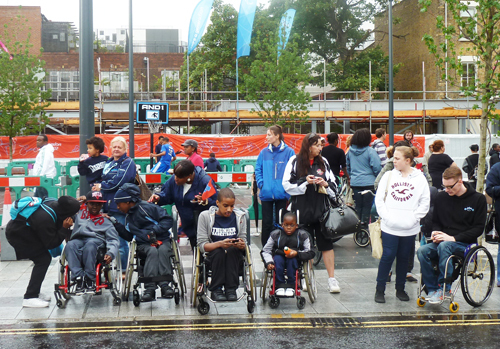 Despite the miserable weather and a two-hour delay, lots of Deptford folk turned up to cheer and wave in Giffin Square. 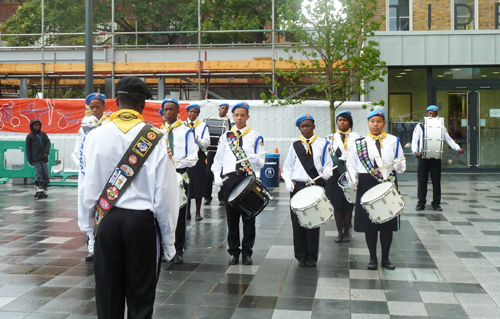 A young marching band stood patiently in the rain, drumming up a mesmerising beat as people waited in excited anticipation. 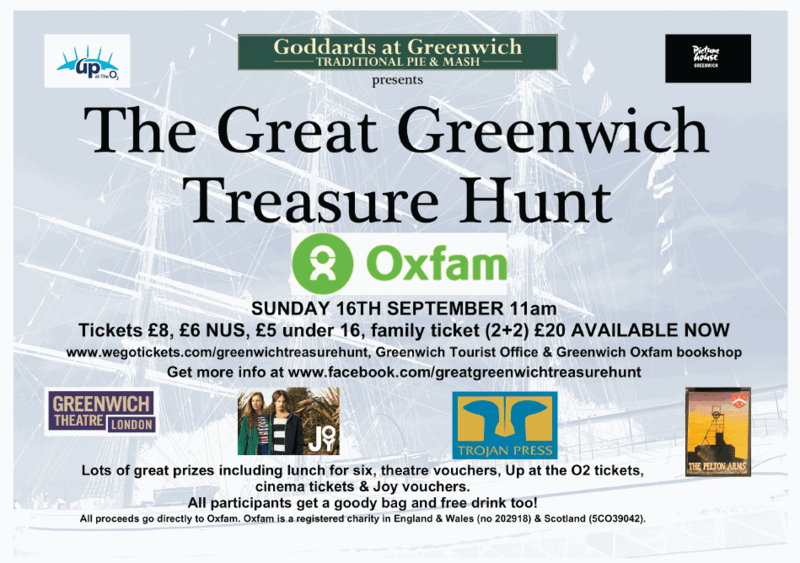 Greenwich Oxfam are holding a Treasure Hunt on Sunday, 16 September. Sponsored by such unlikely candidates as Goddard's Pie and Mash Shops and the Pelton Arms, amongst others, it could be a good fun way of having a fresh look at familiar local landmarks. Here's the poster and, below, what Greenwich Oxfam have to say. On Sunday 16th September Greenwich Oxfam Fundraising Group in conjunction with Visit Greenwich invites you to turn detective around Greenwich and join The Great Greenwich Treasure Hunt. This will be a fun day out which will promote Greenwich whilst raising money for Oxfam. The event is being sponsored by a number of local businesses with Goddard's Pies as the main sponsor. This will be a big event with 150 participants and we hope to raise £1300 for Oxfam through the event. The treasure hunt will consist of a number of questions which teams must answer in the required time by visiting sites and businesses around Greenwich town centre. There will be some great prizes which have been donated by local businesses. These include a two course lunch with drinks for six at Goddard's restaurant and six tickets for any show at Greenwich Theatre. The recommended team size is four to six people and the event is suitable for all ages. Teams will also be encouraged to take photos on the hunt to capture the sights they see around Greenwich. The most interesting photos will be put on display in an exhibition called "Hidden Greenwich" at Greenwich Tourist Information Centre and the best photo will also win a prize. Everyone who completes the treasure hunt will get a free goody bag with money off vouchers for local businesses. Tickets are on sale now at www.wegottickets.com/greenwichtreasurehunt and also in person from both the Greenwich Tourist Information Centre on the Old Royal Naval College site and the Greenwich Oxfam bookshop. They are priced at £8, £6 for students and £5 for under 16's. There are also family tickets available for £20 for up two adults and two under 16's. We recommend you get your tickets in advance as the event is likely to sell out. On the day all participants will need to come to the Greenwich T.I.C. between 12 noon and 12:30pm to register their teams and collect instructions. You will have until 3.30pm to answer all questions and return to a designated meeting place where the answers will be marked and prizes awarded. To get updates on the event you can "like" the facebook page www.facebook.com/GreatGreenwichTreasureHunt or email info.oxfamgreenwich@gmail.com to be added to the event mailing list. A smaller-than-usual Crossfields festival is in the throes of being organised for the first Sunday in September and needs your help. If you want to get involved (have a stall, assist with the bouncy castle, want to play some music, help with the barbeque etc) please email Tim. 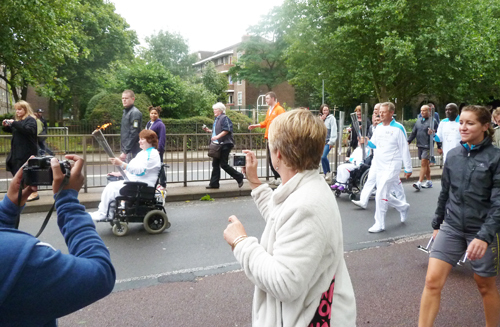 On Wednesday 29 August, Paralympic Torchbearers will be coming through Deptford on their way to the Olympic Stadium. The convoy is expected to arrive in Deptford at approximately 3.15pm. It will travel down Evelyn Street, turn right into Deptford High Street, left into Giffin Street passing Deptford Lounge and Wavelengths Leisure Centre. From there it will turn left into Deptford Church Street and will be handed to Greenwich at the junction with Creek Road. There will be entertainment at Deptford Lounge throughout the afternoon. 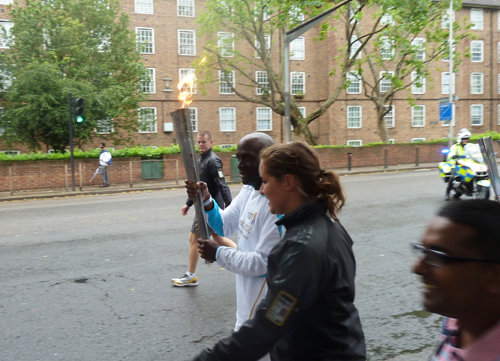 Full details of the Paralympic Torch Relay are being updated regularly on the London 2012 website. 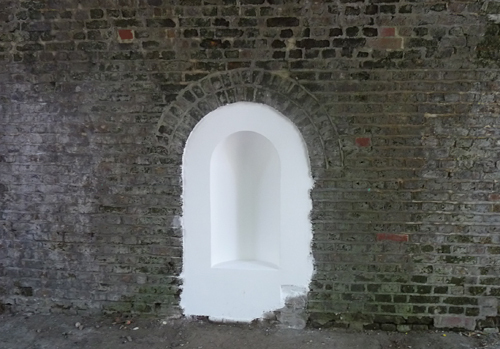 This small white classical niche appeared in one our arches (next to Browne House) in the last week of July and no one seemed to know how it got there. It turned out to be an artwork by Joe Morris called Niche, part of Deptford X Fringe, which finished last weekend. The blurb says, "At a time when Deptford is in the throes of regeneration and the country is in a prolonged state of financial austerity, ‘Niche’ invites the viewer to consider whether we have lost our heritage." It's a nice legacy from the festival and certainly a more lovely addition to our arches than the unseemly amount of dogshit occupying the next but one couple of arches, left by an unidentified dog-owner who, according to the caretakers, comes from outside the estate – let's hope it's not one of our own residents. Who's been nabbing your nuts? Crossfields resident Mariza has sent us this photo of one of the more recent arrivals on the estate. 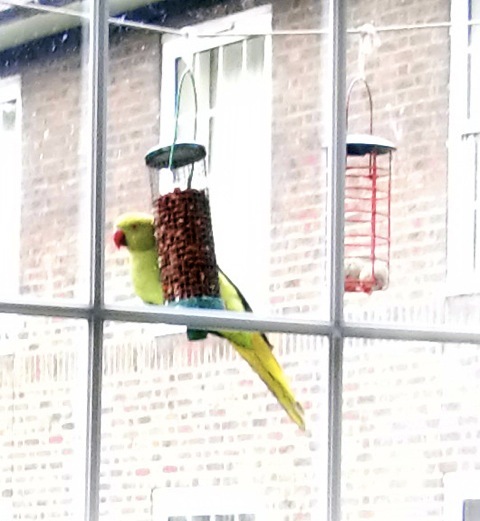 These Parakeets are a recent addition to the local wildlife. Even last year they were mostly seen (and heard!) flying past off the heath and Greenwich park. But this year they seem to have become regular visitors, using the ash tree outside my window to swoop down on Mariza's birdfeeder and, no doubt, many others. I have mixed feelings about these birds. They are actually very striking, exotic looking creatures but they spoil things by making the ugliest of raucous squawks: they seem incapable of taking off without screeching ''Look at me, I can fly!'' And, as the picture shows, they're not shy of taking other birds' food (Mariza mentions that the feeder is there for our indigenous species). So if they're nicking the food put out for those beautiful goldfinches, who can back up their good looks with a pleasing song or two, I suppose Parakeets are more a nuisance than a blessing. A few years ago in Oxleas wood I saw a green woodpecker digging an insect of some sort from a tree branch. A watchful parakeet was keeping a very close eye on proceedings from just below and, once the woodpecker's beak had done the task it was adapted for, the parakeet swooped in, scared the woodpecker away and grabbed the food for itself. So how do you judge this behaviour? Intelligent, adaptable, enterprising or the worst kind of exploitative capitalist? ps: for family reasons I found myself on a cruise ship on the river Rhine earlier this summer and I was astonished to hear the same shrieking din from the shore. I couldn't see them so I can't confirm that they've invaded Germany as well, but it certainly sounded exactly like them. The Channel 4 Dispatches investigative team visited Deptford High Street back in May to take a look at the plethora of betting shops and interview some locals on their feelings about the situation. The team also visited other high streets to get the national picture. The resulting programme, Britiain's High Street Gamble will be aired this coming Monday 6 August at 8pm on Channel 4. 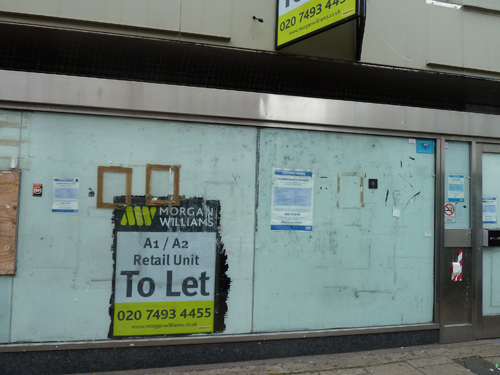 "Britain's high streets are struggling to survive, but one business is booming; betting shops. On average one new bookie opens every week. In one London high street there are now 10 within yards and the locals are fed up. What's driving this gambling boom and what's the impact on our communities? Michael Crick investigates the rise of High Street gambling. He hears from an apologetic politician who now admits they got the gambling laws wrong, and from those most affected by the spread of the betting shops." Meanwhile, thanks to a clause in the original planning permission for the ex-Halifax site at 93-95 Deptford High Street, Lewisham Planning and the government inspectorate have managed to fight off Betfred's exhaustive attempt to become the eighth betting shop in the high street. Betfred seem to have given up for now, if this To Let sign is anything to go by. However, the problem has not gone away, especially since the recent Select Committee's Review of the 2005 Gambling Act ("A bet worth taking?" published on 24 July) has seen fit to recommend an increase in the allowance of Fixed Odd Betting Terminals (FOBTs) from 4 to as many as 20 – per shop! See Daily Mail report based on the programme. 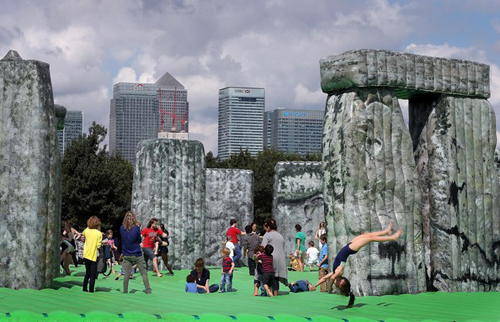 A life-size replica of Stonehenge – which is also a giant fully operational bouncy castle – returns to South London for one day only (last bounced on in these parts at Greenwich Peninsula). It will be in Burgess Park on Saturday till 6pm. Pick up the 436 or 171 to the Old Kent Road and get off at St Giles Church (or opposite Curry's). 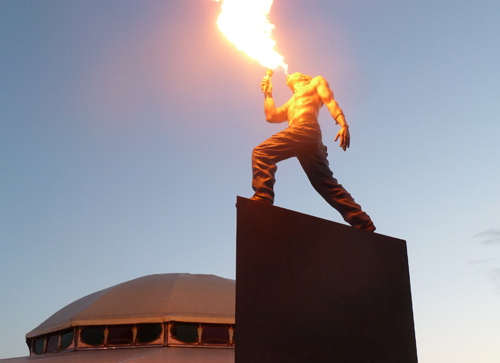 Sacrilege was made by Turner Prize-winning artist Jeremy Deller and has been touring the country as part of the Cultural Olympiad. 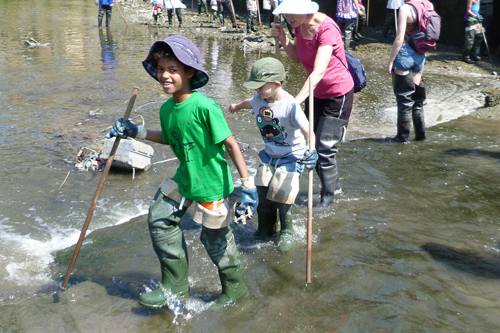 A free day of activities for children and adults to explore the local wildlife in and around Deptford Creek. Back to the Olympics, Super Saturday is the day when most medals can be won. Up on the heath, apart from the Big Screen showing the live Olympic action, there'll be performances from local bands and local talent, loads of stalls and carnival – a mini Lewisham People's Day in a brand new setting. More here. Lewisham Council expect large crowds on Sunday evening when local lad Conrad Williams may be in the 400m semi-finals at 8.40pm...and Usain Bolt runs the men's 100m final at 9.50pm. At the Old Royal Naval College, as well as the Big Screen, there's free entertainment all day Saturday and Sunday till 10.30pm, with music, film and street arts, as part of Greenwich Summer Festival. Ticketed events throughout the festival which require booking include comedy shows and Midsummer Night Flicks. 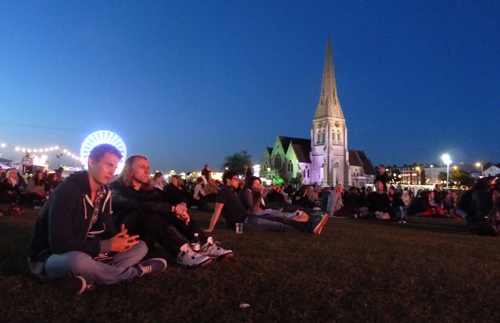 A relaxed crowd at Lewisham Big Screen on Friday evening – the start of the Athletics. As the second week of Deptford X gets under way, we managed to get along to Bearspace to see a show by one of the artists invited by the curators Hew Locke & Indra Khanna – Dzine. His piece has only just been installed (it was delayed by customs), and is accompanied by a wall piece and a video. 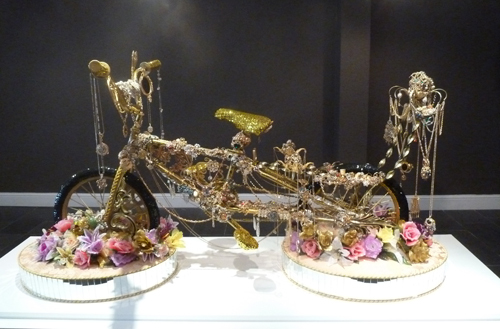 Dzine has created a sculpture which takes its inspiration from the 'Szwaybar' custom-made low-riding bicycles of the youth of Curacao, though this life-size bike is embellished with 24-carat gold leaf, crystals and jewels. You can see the Curacao boys riding their bikes in the video, displaying the same flashy moves as any young lad round here might show off on his bike, though going forwards whilst appearing to go sideways is a new one on us (maybe just showing our age or gender). All without helmets of course. Read more about Dzine on the Deptford X website. This show just happens to co-incide with the triumphs of golden boy Bradley Wiggins and team GB – whose cycling techniques, of course, are somewhat different. Blingtastic. There's a guided walk on Saturday starting at 2pm at Bearspace Gallery that will cover the fringe artists in the festival (pay what you can) or why not try a cycling tour (£10). 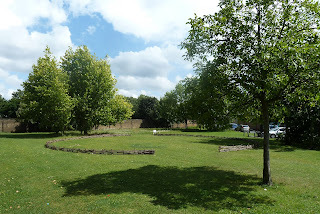 Transpontine has highlighted an event on Saturday 5 August (starts 11am) which sounds interesting: a Three-sided football tournament at Fordham Park (three teams playing on an hexagonal pitch, winners are who concede the least goals). Caroline's Miscellany posted last Sunday on what she had managed to see on the first weekend (all of which are still on show). Close to home on Creekside, don't forget Faircharm Fair, Creekside Artists' designer-makers indoor market (less pricey than Cockpit Arts) – lots of great jewellery and hand-crafted items – Saturday & Sunday 4 & 5 August, 11am - 6am. Have a look on the map for more stuff to see on Creekside and further afield. David Mach's Hell Bent at Lewisham's Big Screen site on Blackheath. 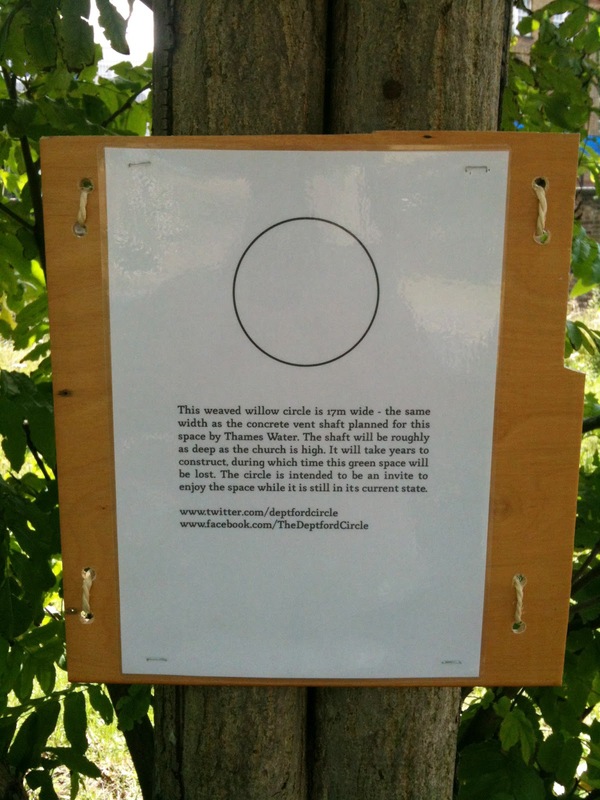 A sign adjacent to the circle reads: This weaved willow circle is 17m wide – the same width as the concrete vent shaft planned for this space by Thames Water. The shaft will be roughly as deep as the church is high. It will take years to construct during which time this green space will be lost. 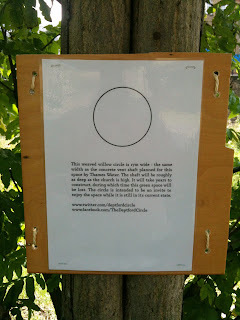 The circle is intended to be an invite to enjoy the space while it is still in its current state.